My friend exhorts me to try McCormick and Schmick's Happy Hour specials, served from 4-6:30 (and from 9-11 am, as it turns out) at the Galleria area Uptown Park, only in the capacious bar area. So, I resolve to go try it myself; I arrive at around 4:30, when I am instructed to simply seat myself. I promptly ordered the cheeseburger, medium rare, and waited as I read the other parts of the menu. First of all, the cheeseburger is really $2.95, although there are other items on the menu which were $1.95 (the parmesan fried asparagus looked particularly interesting). Then my eyes spotted the small print. Ah, so that's the kicker. That's why the waitress kept coming back and asking if I made up my mind about a drink yet. I ordered an Arnold Palmer (which I had only recently learned was a mixture of lemonade and iced tea). The drink was fine, if a bit overly iced. Not sure if it is worth $3.85. My burger arrived a bit later, a bit cold, with a small collection of fries near it. The fries were somewhat tough; I suspect that they were fried once, allowed to cool (or even refrigerated), before being fried again. It was a decent enough cheeseburger for $3, but inferior to the $5 Smashburger. Well, the deceptive drink requirement effectively pushes that price up anyway. On the same trip, we had dessert next door at Crave Cupcakes. The store looks like it was pulled out of some LA design studio, with a minimalist aesthetic that is very pretty in bright sunlight. But how was the product? 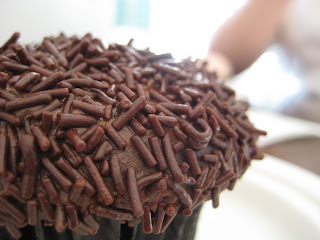 I ordered a dark chocolate flavored cupcake - it was reasonably sized, frosted with a thin layer of butter cream, and sprinkled heavily with chocolate sprinkles. The sprinkles themselves tasted artificial, perhaps constructed out of "mockolate", which distracted from the flavor of the frosting or the cake. The cake itself was rather fragile, falling apart readily when peeled from the liner that it is served from, perhaps to improve the impression of moistness. But the chocolate notes were there, albeit not quite as aggressive as the name implies. It is a serviceable snack/dessert, but not too remarkable, again, specially considering the price (at $3.25, it was more expensive than the burger I just had). I had wanted to evaluate the quality of the frosting, but I couldn't even really taste it.